The new Android Internet Bundle plan is specifically tailored to empower Android users to connect with business associates, family and friends and also enable them enjoy an amazing data experience on their smartphones. The Bundle plan comes in two variants, the Android 2.0, which comes with 2GBdata designed for medium Internet users while the Android Bundle 4.5 with 4.5GB data is tailored for high Internet consumers. 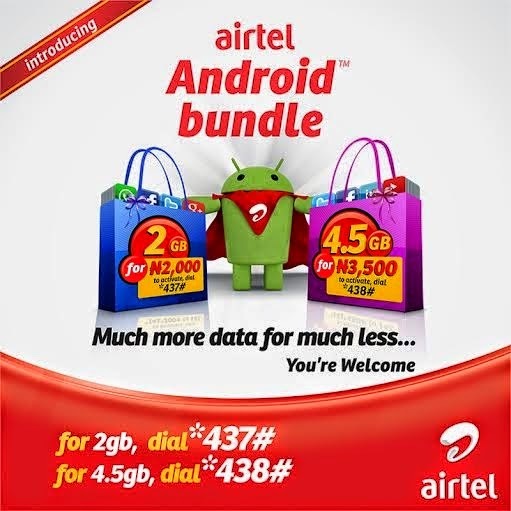 First of its kind in terms of data offerings in Nigeria, the Airtel Android packages offer customers sufficient data to browse on their Android phones at very affordable rates. With the introduction of these packages, customers using Android phones no longer have to worry about affordability and the required data needed to enjoy an amazing browsing experience on the Airtel network. The 2GB and 4.5GB Bundles go for a rate of N2,000 and N3,500, respectively and are both valid for 30 days.Both Bundles have different burn rates, allowing customers to enjoy the service at a more affordable rate during the night.